He acts as in “Lethal Weapon“. He’s again funny, cold-blooded and ruthless. 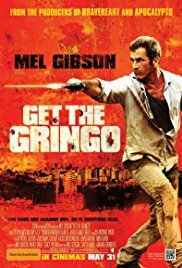 “Get the Gringo” is a fun action movie. Location : A Mexican prison. There’s almost non-stop action. Mel Gibson plays a magnificent part. But most of all it’s Kevin Hernandez who shines as the Mexican boy who’s showing Mel the ropes in that harsh prison.